Keto, Flexible, Vegetarian, Mediterranean, Atkins – these are just some of the diet fads that made rounds this year. In this day and age, information about food is so overwhelming. Problem is, there are so much differing information when it comes to nutrition that figuring out the healthiest way to eat and knowing what kind of diet works for you may be really hard to figure out. Hence, it makes sense that a lot of people put their diet plans in the hands of a nutritionist. Before we proceed, let us first define what a nutritionist is; and how it differs from a registered dietitian. Although these two professions are related, many people use the terms “nutritionists” and “dieticians” interchangeably. The biggest difference between them are the legal restrictions that each title carries. Only those who are registered with Commission on Dietetic Registration (CDR) may legally declare themselves as Registered Dietitians (RDs). On the other hand, the nutritionist profession is much less protected under the law and are often free from government regulations. Some states may require nutritionists to obtain an occupational license from a Nutritional Board, while other states allow individuals to practice as nutritionists without any previous education, training, or work experience. Now that you know the difference between the two, let’s browse through the pros and cons of hiring one. You’ll go beyond fad diets. Nutritionists do not try and sell you diet trends just because everyone on the internet is telling you to try them. Instead, they help you find a diet that is actually fit for you and your lifestyle. Nutritionists and RDs alike, want you to succeed long-term. They can design personal plans. Though seeking pieces of advice online and reading about other people’s diet experiences can be interesting and convenient, these plans may not exactly work for your body. A nutritionist will first consider a lot of things before they design your health plan. Medical nutrition therapy, or nutrition counseling is based on the individual’s biophysical makeup and lifestyle habits. Nutritionists typically ask what kinds of food you usually eat, your health history, and fitness routines. By taking all this information into consideration, they use their expertise to give you a diet plan specific to you. Through this, you will receive personalized care as opposed to blanket-approach advice from the internet, diet books, and nutrition trends that may or may not work for you. They can help you achieve your fitness goals. Whether you are trying to cut weight or trying to put on some healthy muscle mass, a nutritionist can help you achieve your goals by sharing effective weight-loss or weight-gain routines. If you are having trouble making progress with your current diet and fitness lifestyle, a little help from a nutritionist may be exactly what you need. They can spot nutrient deficiencies. Even if you think you are following a balanced diet, you could still be missing nutrients in your daily food intake that may make a major impact on the way you feel. Hiring a nutritionist or dietitian can help you discover what may be lacking. Dietitians are trained to spot nutrient deficiencies and help you to correct them. If you have allergies and other dietary restrictions, they are the right people to talk to as they will consider these during your consultation. They can also help manage symptoms of illnesses such as Diabetes and Hypertension. If your diet is a main contributing factor to your disease, a nutritionist may even be able to help lessen the severity. They can help you develop a healthy relationship with food. A good nutritionist will not only help you figure out what to eat, but they will also help you sustain a good relationship with your diet. They administer nutrition advice in a manner that encourages healthy eating behaviors and lifestyle sustainability. Some give maintenance strategies like journaling, mindful eating, assisted grocery shopping, or simply holding you accountable. Nutritionists, apart from helping you strengthen your knowledge on food, may also help you improve your body image, boost your self-confidence, and support your daily lifestyle. Diets can feel restrictive. Hiring an expert and following a diet may feel restricting at first, especially if you are used to eating freely. Depending on how counseling is done, some people may feel stressed out when consulting to experts. Being too stressed out and too focused on your food intake may be detrimental and may lead to disordered eating behaviors instead. Insurance doesn’t always cover it. Unfortunately, hiring a nutritionist is not cheap; and not all insurance packages cover seeing a nutritionist or dietitian. Costs and charges may vary depending on location, experience, and their specialty. How often and long you work with your nutritionist also depends on your agreement. Some schedule only two or three appointments, while others work together for years. 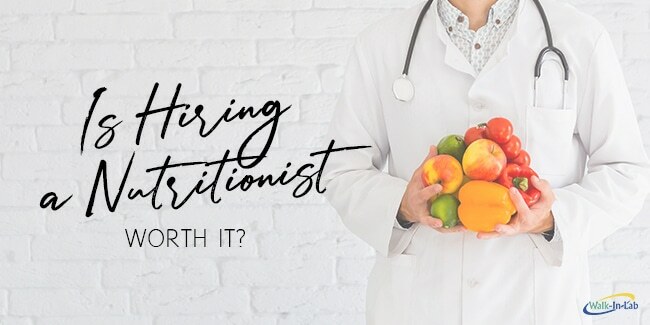 According to studies, the average cost of nutritionists in 2019 are as follows: $45 for a half-hour session, and $60 to $90 for a one-hour session. Some also provide monthly packages that can cost between $190 to $540 depending on the frequency of the services. Finding the right person can be a challenge. Finding a dietitian is almost as hard as finding a therapist. Hiring someone that does not align with your beliefs can feel frustrating. Instead of making you feel better, it might even make you feel worse. Hence, looking for the best person to start your journey with may take a long time and some trial and error. They don’t always tackle underlying issues. Hiring a nutritionist can be helpful when it comes to managing health issues. However, nutritionists may not always take into account the whole picture. Note that their consultation packages may differ depending on their certifications and specialties. Hence, just working with a nutritionist may not always address the underlying context for weight issues. Without having the baseline context, more nutrition information is not going to be that useful. Now that you know the pros and cons of hiring a nutritionist, it is important to figure out where to start. A nutritional baseline is the starting point for your healthcare provider. Items that may be included in a nutritional baseline include height, weight, Body Mass Index, blood work, and typical daily nutrition intake. Good news for you, you can have yourself checked click here to know your baseline and jumpstart your journey to a healthier lifestyle!